#8 Bedroom"Casita"/ multi purpose room/Murphy king or Futon Couch Double with bathroom. Air Stream for 2 $300/nt extra +$75 clean out fee located on the lower patio across from the Bocci Ball Court. Entry level Great room / Gourmet kitchen, island, dining, bar and den. The Casita is a detached recreation room with ping pong, game table, video viewing wide screen tv and sleeping. Living room has a huge wood fire place, couches, Flat screen tv with surround stereo and video library. IPod extension. Master 1 bedroom has beautiful handcrafted fireplace with local rock, plasma flat screen tv , den has high definition flat screen tv/room by room list of amenities please visit our website. Outdoor oak BBQ and on the lower driveway/patio there isseparate fire pit for sitting under the stars adjacent to a bocci ball court. A short walk down the driveway is a 20 yd. 2 LANE LAP POOL complete with SPA and Kid's baja step and an elliptical workout machine in the pool house. Lawn volley ball and horse shoe court. Across from the pool is a wonderful tennis court with baseball hoop. This luxury Custom Home has panoramic views of the beautiful private valley on an 850 acre working cattle ranch. Cottontail Creek Ranch also raises avocados, oranges, and kiwis. Put on your hiking shoes and explore the ranch via Jeep trails and cow trails. You will be treated to wildlife, valley views, large pond with catch and release fishing and kayaking. Spectacular views of Pacific Coastline from ridge tops. Massage Therapy and chefs can be arranged as well as an Aussie Wrangle who will take you riding at the beach or another location. Pipe corrals for horse owners who want to bring their own horses to ride on the ranch or nearby public trails at Cayucos Beach, Montana de Oro State Park, or National Forest in Pozo. Horseback riding can be arranged with an independent wrangler who will bring horses you elsewhere. The Paso Robles Wine Country is 15 minutes away while the beach is just 12 minutes away. Nearby attractions include Hearst Castle, Cambria, Big Sur Coastline, Morro Bay, and San Luis Obispo area wine tasting. Shopping and Farmers Markets in Cambria, San Luis Obispo, Templeton and Morro Bay. Great windsurfing, surfing, biking nearby. Scheduled air service, United Express, Delta, and US Air is 40 minutes in San Luis Obispo. Ground transportation to San Luis Obispo or Paso Robles via Amtrak. VRBO Bear stayed here - 04/24/2009 When my bear family and I arrived at the Cottontail Creek Ranch, we instantly felt at home! 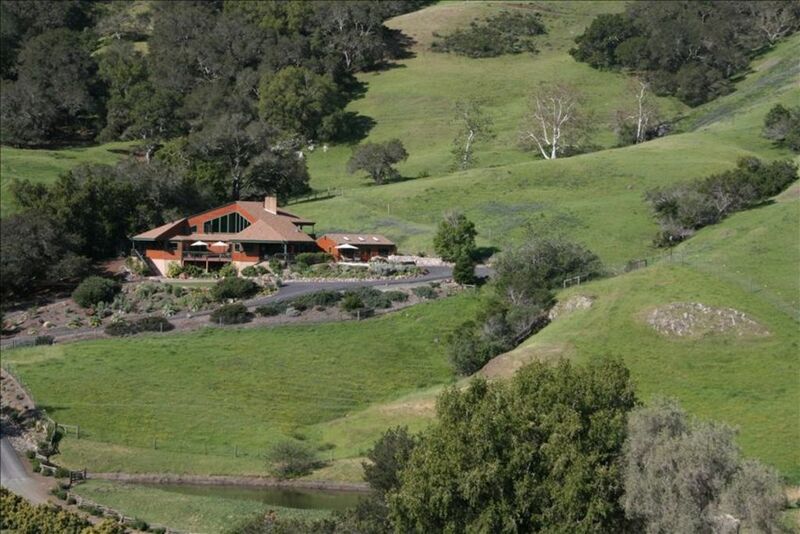 This luxury ranch retreat is nestled among some of California’s most breathtaking rolling hills. The location beckons you to enjoy the outdoors and everything the Central Coast has to offer. Whether you like to hike, fish, horseback ride, surf, or just simply hang out and enjoy some of the most awe inspiring views this home has to offer, this is the place for you! Our gracious hosts, Roger and Susan, made our arrival special in so many ways. From the beautiful fresh cut flowers in every bedroom to the delicious fresh fruit picked right from the ranch orchards to the awesome homemade cookies, no detail was overlooked. They took us on a tour of their 850 acre working ranch and we marveled at the incredible view overlooking the Estero Bay. The fresh air carried the fabulous scent of their orange orchards and flowers blossoming throughout the property. Plus, we were free to eat anything that was ripe and ready for picking on the grounds. We enjoyed lemons, oranges, avocados and fresh herbs. It was simply amazing! The fabulous surroundings, wide open spaces and views truly recharged our spirits. The home itself rivaled the ranch’s outside surroundings. From the historical Monterey pine floors to the custom woodwork, this home really showcased the owners’ personality and artistic flair. Susan’s whimsical artwork and Roger’s intricate woodwork throughout the home exuded warmth. They truly put their hearts and hands into making sure that we felt right at home. Cottontail Creek Ranch featured 5 luxurious bedrooms, each with their own personal baths. Everyone had their own personal space to retreat to and relax. The home’s floor plan was perfect for togetherness and included great family gathering spots like a fully equipped gourmet kitchen, spacious dining room as well as the large living room with its massive rock fireplace. Every room had an incredible view to enjoy. We spent evenings around the great fire pit or soaking in the steaming spa reminiscing about the day’s adventures. It was the perfect home for a reunion or celebration! If you must venture away from this private paradise, Cottontail Creek Ranch is in close proximity to the vineyards of Paso Robles, fabulous seafood in Morro Bay, and the quaint coastal town of Cayucos. It’s also a convenient home base to launch an excursion up the coast to visit Hearst Castle or explore the craggy coast of Big Sur. We have not stopped talking about our visit to the California Central Coast and the Cottontail Creek Ranch. Thanks Roger and Susan for a great stay! Pictured are sons Kristopher and MIchael with Susan and Roger sitting on our 90 year old 90 foot Monterey Pine that had died in the front yard of our old Magetti farm house. We had it milled and installed as flooring and trim in the downstairs main area of our Cottontail Creek Ranch house. It is like walking on liquid carmel corn. How did we get started in the Vacation Rental business? In 1999 our family had been living on Cottontail Creek Road on the Magetti Ranch for 22 years when the adjoining property came on the market. We wanted to expand agriculturally which we immediately did by adding more avocados, more cattle and oranges to the ranch. That left the question, what do we do with this extraordinary Cottontail Creek Ranch home built in 1978? Our goal is sustainability and the vacation rental does that as well as fulfills the home's destiny by entertaining tourists from around the world. The house truly combines luxury and homeyness while the views beckon you outdoors. We feel that Cottontail Creek Ranch is the perfect location for sharing this part of old California with others. The byproduct of this has been meeting wonderful people while connecting them to the land. 'So much to Do or NOT, Close to everything the Central Coast has to offer' is what I tell potential guests. Walk in the hills and valleys. Meet the cows and chickens. Take a tour of the orchards. Pick herbs out of the landscaping. Breath in the country. Order CTC grass fed beef, check our website to order. If you do choose to venture out and leave the ranch the first wine tasting room is 15 minutes away and the beach is 12 minutes the opposite direction. The climate is moderate with a marine influence without a lot of fog and the extreme heat of inland, ' JUST RIGHT'! Staying at the ranch can be restful and quiet or full of activity, your choice. The location of our home makes it easy for our guests to enjoy the great outdoors without leaving the house, the patios and porches. You can also fill your days with hiking, walking and biking the property then take off for some wine tasting and beach activities or drive to Hearst Castle for a tour and the Big Sur Coast. We share any fruit and vegetables that are ready for harvest. We normally have oranges, lemons and limes all year long. Seasonally we have avocados, herbs and artichokes from the edible landscaping. It is great to live off the land. 12-15 minutes gets you to Cayucos Beach. Absolutely beautiful house and property! We couldn't have been more pleased. A perfect getaway for our group. Fabulous Place for Family Vacation! First of all, Susan was a wonderful host, she always answered my emails and phone calls within minutes. She was able to accommodate all of my requests and went out of her way to take care of all of our needs. The house is absolutely gorgeous, very well-maintained. You can tell that Susan loves this house and all the property around it. We were met in the kitchen with a huge bowl of freshly-picked oranges and avocados! There are various little ornaments and trinkets around the estate, done tastefully, showing a true love for the place. Everything was very clean, and we did not find any disrepair on the 850 acres. We enjoyed talking to Susan and reading various articles about the ranch and Chopper. Such a fantastic story! What we loved most was that for our family of 18 never had to leave, except to buy food. There were so many things to do at Cottontail Creek Ranch. We enjoyed the Bocce ball, horseshoes, two jacuzzies, swimming pool, endless walking/running trails (some are NOT for the faint of heart! ), ping pong, board games, gorgeous fire pit, an enormous kitchen that’s large enough to accommodate several “chefs”, lounge chairs on the patios to sit outside at night and enjoy the zillions of stars. It was such a relaxing place, so quiet, so lovely. Susan offered to take us in her truck to the “ridge” where she described the hills around the property and told stories of the land, her family, the history, the conservancy. It was so interesting, and such a wild ride! Breathtaking views to the ocean, Cambria, Morrow Bay. Well-worth the experience. All in all, I heartily recommend the Cottontail Creek Ranch for an event for a large number of people. You will be so impressed with the serenity and peacefulness that will surround you. The property was perfect for a 90th birthday party. Our group had 17 adults from Northern Cal and Southern Cal, a good spot in the middle. The property is in excellent condition and offered a large location for lots of adults. Spent most of the time at the property using the pool, corn hole game, hiking, bocci ball, etc. One day took a bus on a winery tour and visited Summerwood and Niner, great lunch at Niner. This place was better than it looks on line. Thank you Susan for a wonderful stay. Bob K.
There are tweleve of us ladies, we're a Bunco group that has been together for years. We take a weekend trip in February each year. Our criteria is specific, we need at least 6 bedrooms, and 5-6 baths. Comfort is important, we're decades past winging it on couches and standing in line for a bathroom. Susan, and her Cottontail Ranch, provided the perfect experience for our trip. The house was wonderful, with a large, open kitchen, dining, and den area for us to gather. A nice living room, and two large master suites were upstairs. Downstairs three comfortable bedroom/bath situations waited off the den, and another, small bedroom was off the kitchen. There's also quirky lofts, a treasure trove for a house full of kids. And finally, a game room, just outside the back door, with additional sleeping space. Decks surrounded the house, overlooking this beautiful ranch, filled with cows, avocados, and citrus trees. The house and setting itself made the weekend perfect, but what made it remarkable was Susan and her hospitality. The table was lovely, set for all twelve of us when we arrived-- that's never happened in any house I've rented in the past 15 years. Susan, who obviously is proud of her ranch--and rightfully so-- offered to give us a tour of the property, amazing, and so much fun. The trip was full of lovely surprises and the warmest hospitality. We planned on scouting around some, but Cottontail Ranch was so enchanting we ended up staying at 'home', eating in (the kitchen was fully equipped) and playing games. Thanks so much, Susan, for the best girls weekend ever- we will be back! To have guests like these wonderful women enjoying Cottontail Creek Ranch, inside and out. These gals were icing on the cake!! Having the privilege in this life to share and take care of a place like such as this. As fantastic as Cottontail Creek Ranch looks in this listing, the reality is even better. Start with the house: generously sized, with enough bedrooms and bathrooms to house a small army, and a nice big kitchen in which to play around. There are plenty of fun books around, a cozy living room set around a fireplace, a piano, and everywhere a lovely view of the valley. We hardly used the casita (because we were outside most of the time), but it makes for a great space to stay up late when the rest of your peeps have tucked in. How about the outdoors? Well, if you're a walker, there are 850 acres to walk. That's, like, a mile in every direction. If you're a swimmer, you have a lovely pool. If you're a tennis player, the court is lovely - and if you're not, there are plenty of racquets and balls provided so you can pretend you are. There's a bocce court, a fire pit, and a basketball hoop. My friends and I set up two bands worth of music gear on the patio and jammed to our hearts' content. And lastly, Susan, our host. Generous, caring, helpful, pleasant, and friendly. She made everything easy for us, arriving and departing. This was our first time at CTC, and I'm certain it won't be our last. It's an amazing place, a true California experience. I can't recommend it enough. Thank you for your wonderful review. It was a pleasure having you all at the ranch. Our hopes are always that the ranch surpasses all guests expectations including the time to fall in love with the land. Urgent care in Morro Bay 15 min.